The Crow: City of Angels is a 1996 American supernatural superhero film directed by Tim Pope. It is a sequel to the 1994 film The Crow and the second installment in The Crow film series. In Los Angeles, mechanic Ashe Corven and his eight-year-old son Danny are murdered by notorious drug kingpin Judah Earl after they witness a gang of Judah's henchmen murdering a fellow drug dealer. The two are then dumped into a harbor. Sarah from the first film is now an adult, working in a tattoo parlor by day, and painting surreal images of death and resurrection in her apartment at night. She is haunted by disturbing dreams about Ashe and Danny, and after a day's work in the tattoo parlor, Sarah is visited in her apartment by a large crow as she contemplates a ring that Eric Draven gave her years before. Sarah arrives there to find Ashe brooding, and she explains to him why he has been resurrected by the Crow so he can take revenge against the criminals who killed him and Danny. With the guidance of the crow, Ashe starts killing Judah's henchmen, one by one. Ashe first visits Spider-Monkey in a drug warehouse and interrogates him as to who else was involved in the murders. Ashe then kills him by blowing up the building. Another of Judah's lackeys, Nemo, is spending the night at a peeping booth. Ashe appears in the booth, and kills him, leaving a doll stuffed in his pants with a paper crow in his mouth. Judah has in his employ a blind prophetess named Sybil who is able to ascertain Ashe's link to Sarah and to the crow that is the source of his powers. Judah captures Sarah in order to draw Ashe to him and steal his power. One of the murderers, Kali, goes to Sarah's apartment to draw Ashe out. While battling her, Ashe realizes that Kali is the one who killed Danny; enraged, he throws her against a wall that breaks her leg, and then out a window, leaving a crow-shaped blood pattern. Ashe then pursues Judah's right-hand-man, Curve, in a motorcycle chase. Ashe shoots Curve's motorcycle, which blows up and throws Curve onto the road. Ashe then drags Curve into the nearby river, leaving him to die as local parishioners cast down flower petals in the shape of a crow. On the day of the annual Day of the Dead festival. Judah captures the crow and impales its wings with knives before killing it. He then ingests the crow's blood, stealing Ashe's power. Suddenly mortal, Ashe nearly dies from the shock, but is revived after seeing a vision of Danny telling him to keep fighting. Ashe must now attempt to rescue Sarah by seeking out Judah in his lair, an abandoned church. Judah gets the best of the weakened Ashe in the ensuing fight. Judah ties a rope around Ashe and savagely whips him, intending to hang him. Sarah rushes up and stabs Judah in the forehead, causing Judah to drop Ashe. Judah pulls out the knife and starts moving toward Ashe. Sarah gets in the way, and Judah stabs her in the stomach. Ashe gets up and impales Judah on a metal pipe, but this does not kill Judah either. While Judah is still impaled, Ashe calls upon a murder of crows, which devour Judah. Sarah dies in Ashe's arms, a tableau reminiscent of a painting she had completed earlier in the film. Ashe returns to death, knowing that he can rest in peace with Sarah, and his son. After the success of The Crow, Miramax commissioned a sequel, and production began in August 1995. The Weinstein Brothers offered directing duties to Tim Pope on the basis of his work on a short film, Phone, he made in 1991. David S. Goyer was brought on to write the script. Wanting to avoid comparisons with the first film and Brandon Lee, Goyer originally intended to have the character of Sarah return as a female crow. Another idea was to set the story in 19th-century England. Eventually, it was decided the story would be centred on two brothers who are murdered in Los Angeles. In that script, Ashe and Danny were the brothers, with Ashe being the one brought back to avenge their deaths. The original script also featured two of the villains from the first film, Grange and Top Dollar, resurrected to fight Ashe. Goyer was unhappy about reviving Grange and Top Dollar and rewrote the script removing them entirely. Alex McDowell, who worked on the previous film and had also worked with Pope on music videos, was brought back as production designer and both aimed to give the film a distinguished look. McDowell took inspiration for the design of Los Angeles by looking at architecture from the 1920s and 1940s. Returning also from the previous film were producers Jeff Most and Edward R. Pressman. Both Goyer and Pope wanted to make the film completely different from the first one, aiming to give it a more tragic feel, and for the characters to have more depth. While working on the film, Goyer was also writing the script for Dark City, which was directed by the previous film's director Alex Proyas. Punk rock legend Iggy Pop was hired to play the villain Curve; Pop had previously been offered the role of Funboy in the first film. Tori Amos turned down the role of Sarah, while Jon Bon Jovi auditioned for the role of Ashe, but Vincent Pérez got that job in the end. Pérez was selected because of his performance in La Reine Margot. For inspiration, Pérez looked to Jim Morrison and Hamlet. Thomas Jane was picked to play the villain Nemo. While the filmmakers and studio originally intended to create a substantially different film to the first one (out of respect for Brandon Lee), Miramax ordered the film to be re-edited so as to resemble the earlier one as much as possible. Tim Pope refused and he, along with Goyer, eventually disowned the film, as it did not represent their vision. 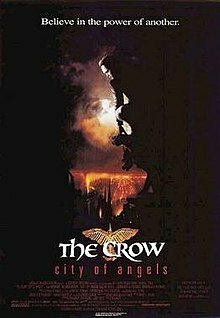 The Crow: City of Angels opened at #1 at the domestic box office and grossed $9,785,111 during its opening weekend, which accounted for 54.6% of its total gross. It also opened at #1 in the UK. The US gross stands at $17,917,287, and the film took in an additional $7,500,000 worldwide. The budget was $13,000,000. While the film was a minor success, it paled in comparison to the previous film's US earnings of $50 million. As a result of the film's lackluster box office results, future Crow sequels were released direct-to-video. The film has a 12% approval rating on Rotten Tomatoes based on 33 reviews; the average rating is 3.4/10. The film's Blu-ray that was released by Echo Bridge Entertainment has been criticized as not being up to high definition standards. It was further criticized for being erroneously labeled as 1080p when the film was, in fact, presented in 1080i. The film was released on VHS in 1996. In 1998, the film was released on DVD. In 2001, a collector's edition was released, labeled "exclusive Director's Cut", which restored 11 minutes of extended footage and included two featurettes and an audio commentary. The film was re-released in 2011 by Echo Bridge Home Entertainment as a double feature, paired up with The Crow: Wicked Prayer. The only special feature was the widescreen format. There was also a single feature release under the same company. The film was released on Blu-ray in May 2011. The film was released as a part of a boxset with The Crow: Salvation in the UK with 1080p picture and DTS-MA 5.1 sound. The only special features were 2 featurettes from the collector's edition. On September 11, 2012, Echo Bridge released another Blu-ray release of the film (once again, a double feature with The Crow: Wicked Prayer). It was already being sold at Walmart stores before its official release date had been reached. This version contained bonus material not present in the original Blu-ray release. On October 7, 2014, it was released on DVD by Lionsgate in a triple feature edition with the other two Crow sequels. The screenplay for City of Angels was adapted into a novel by Chet Williamson as well as a three-issue comic book series published by Kitchen Sink Press. Both feature the original ending of the story, in which Ashe wanders the earth as an undead spirit. A video game tie-in The Crow: City of Angels was made for the PlayStation, Sega Saturn, and Microsoft Windows. The game was to be initially released around the same time as the film but instead released in early 1997. ^ a b "The Crow: City of Angels (1996)". Box Office Mojo. 1996-09-20. Retrieved 2011-01-12. ^ Smith, Adam. "The Crow: City Of Angels". Empire. Retrieved 2015-10-21. ^ Snow, Shauna (1996-09-03). "Morning report". The Los Angeles Times. Retrieved 2010-12-30. ^ "The Crow: City of Angels (1996)". Rotten Tomatoes. Retrieved 2015-04-24. ^ "Buy THE CROW COLLECTION DVD from Lionsgate Shop". Lionsgateshop.com. Retrieved 2 September 2017. ^ "See the Crow!". Sega Saturn Magazine. No. 10. Emap International Limited. August 1996. p. 8. This page was last edited on 3 February 2019, at 10:41 (UTC).